The 2004 Falcon 114 "Hunter"
This vessel is destined to become an iconic vessel on Australian waters, its unique six cabin configuration and perfect size (LOA) to meet most exclusion zone restrictions on our waters, including The Great Barrier Reef- Make it the perfect long range cruiser for the family and entertainer. With multiple usable spaces, "Hunter" gives a feeling of granger and abundance, as soon as you step aboard. 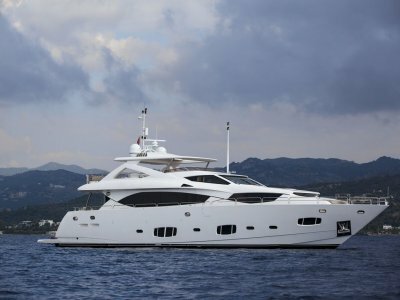 This vessel is highly loaded and recently refurbished, presenting it in turn key condition and ready for immediate boating. RINA Commercial survey class and ready for charter opportunity. The effective rich cherry wood and leather upholstery of the interiors justify Falcon's successful reputation for great design and craftsmanship. The salon is revolutionary in style and entertainment with a TV which rises into view from its recessed cabinet. The spacious dining area features a unique table extending to comfortably seat 12 guests. 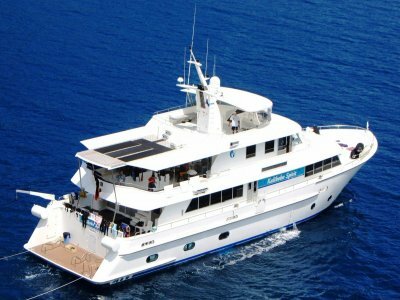 HUNTER accommodates 12 guests in 6 staterooms. The practical full-width master stateroom features an en-suite bathroom with a convenient Jacuzzi and a walk -in wardrobe. The only stateroom on the main deck, a magnificent VIP stateroom that enjoys complete privacy and the en-suite marble bathroom includes a Jacuzzi tub. Also on the lower deck, two convenient doubles and two twin staterooms, with en-suite facilities which accommodate a further 8 guests. 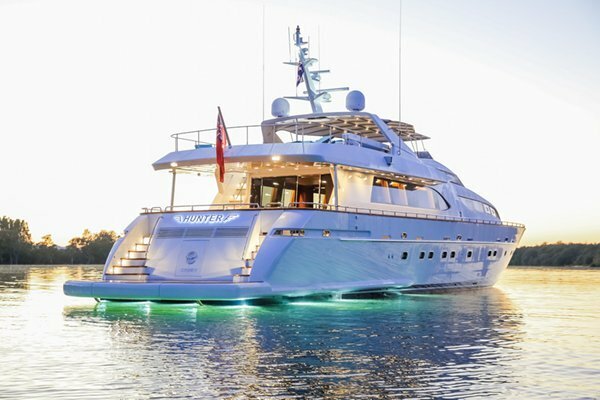 The ultimate Super Yacht is on the market and could be yours today! The Falcon 114 is now available and currently being showcased Ex- Sydney Australia. $3,495,000 EURO (EX GST or local charges)- Please call us today for further details. PABX Phone system, SAT TV, AIS (A), Extensive Navigation equipment including 2 x radars, mulitple sounders. 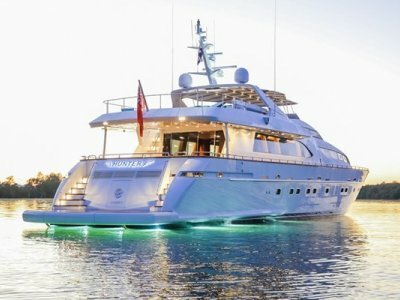 | Remarks: HUNTER is one of the most attractive yachts available. The yacht's broad decks are ideal for lounging and her experienced crew is always at your service. 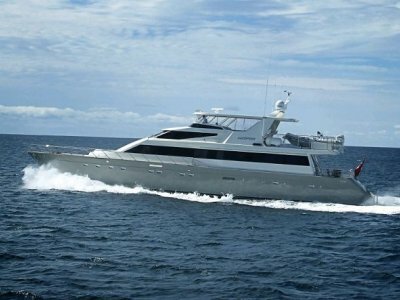 HUNTER is a vessel with plenty of space for entertainment and relaxation.